This section shows the advantages of Waltz, compared to a classical calculator App. You launch the classical calculator, press 1 7 + 3 7 + 9 = and get 350... which seems wrong — this result is too big, ending with zero... obviously not correct ! When using Waltz, you have a feedback about the effective keys pressed : you can check the request you made — in this case, you can literally see that an unexpected * was entered instead of the desired + ! On a classical calculator, if you make a mistake, you need to press the C key, and restart from the beginning. When using Waltz, you just need to touch where you did wrong, edit the entry as you are used to, and ask for a re-evaluation. If you need to clear the screen, touch the symbol, on the top right of the screen. Waltz comes with a few extensions, ready to be activated. To get a list of them, touch and hold down the symbol, on the top right of the screen... If any extension is loaded, it’s name appears in the title. Here is an example of the Mathematics extension, giving access to complex numbers, matrices, conversions, and many other features — thanks to the external math.js library. 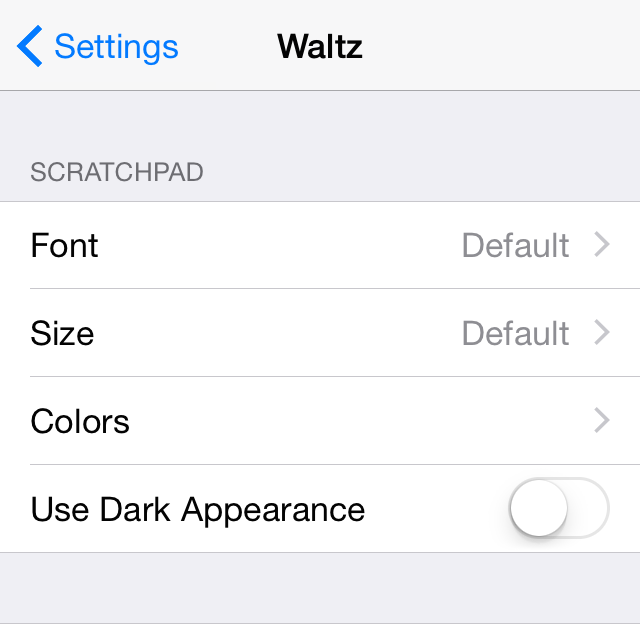 The appearance of the scratchpad of Waltz can be customised in the Settings. Waltz ships with many original fonts you can choose from, changing sizes and colors with sliders, to match your own preferences.